One of the things I was most looking forward to in Japan was tasting all the food and while I did that, I wasn’t expecting the wide range of food experiences I had while in the country. Yes, I ate at restaurants a lot, but many of them were unique experiences themselves with particular customs required. Here are a few unique eating experiences in Japan that I experienced. 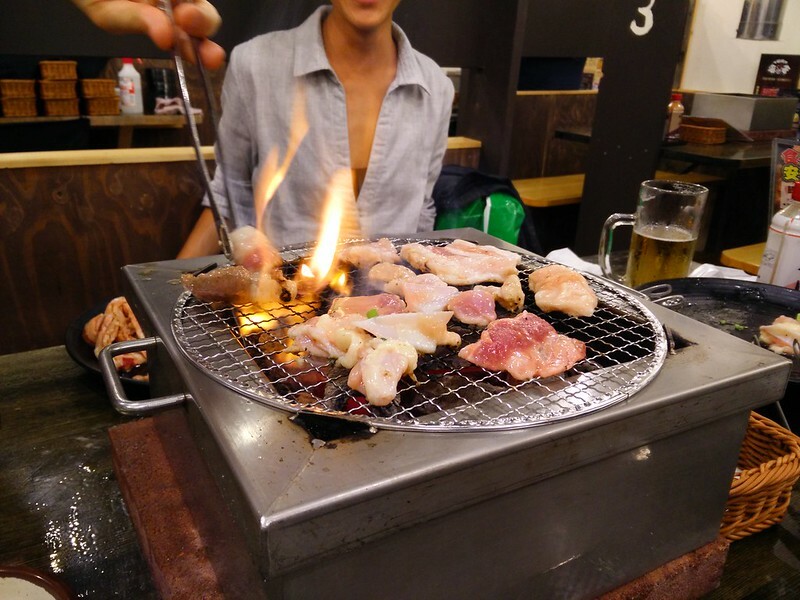 The concept of grilling your own meat is not unique to Japan. Most people are probably familiar with the concept of Korean BBQ. 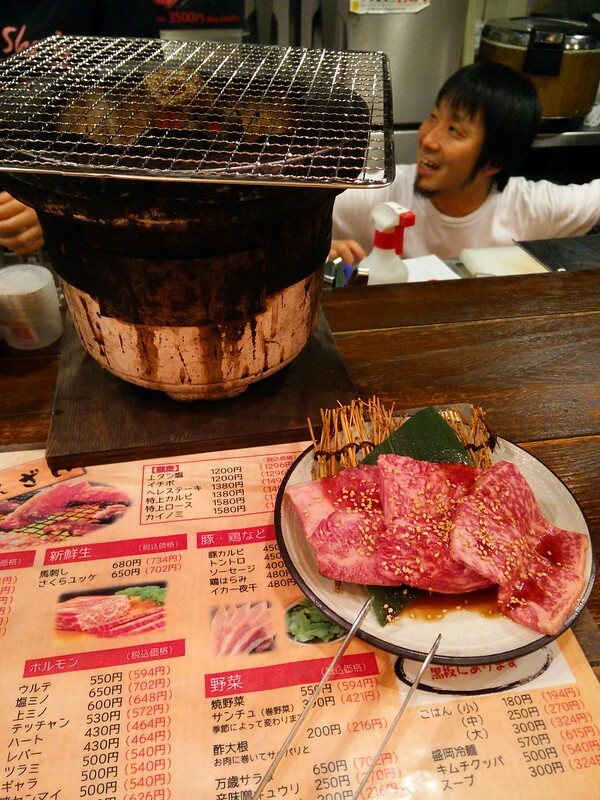 Yakiniku is essentially the same thing where bite sized meat is cooked over a grill at the table. The only differences I could spot is that the grill is slightly different as are the sauces used to marinate the meats. Look at that marbling! My self concious super stealth photo snapping. We unknowingly stumbled into a yakiniku restaurant on our first night in Tokyo when we were incredibly jet lagged. I was drawn in because it just smelled incredible and the place was full. I don’t think they were expecting foreigners who couldn’t read their menu. They were incredibly polite though and helped as much as they possibly could. We later went to another one in Asakusa which had a more extensive menu and was close to an all you can eat style place. It’s a lot of fun to do your own cooking and eat what you like. Be sure to wash everything down with a glass of cold beer. Also be prepared for every item of clothing, and your hair, to smell like meat and smoke. I’ve already sung the praises of the Japanese convenience store, but they’re really a great place to put together a simple and cheap meal. Convenience stores in Japan are nothing like the convenience stores we have in North America. There are so many unique things that you can find in the store. In addition, to the typical items like candy and chips you can also find a massive selection of ready to eat foods. Anything from onigiri (rice balls) to noodles to pickled vegetables. 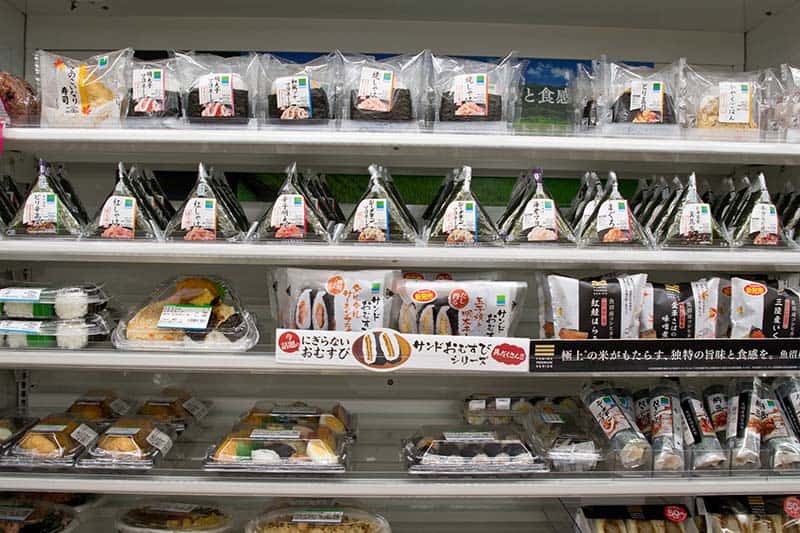 If it’s a part of Japanese food then it’s likely you can find a version of it in the convenience store. They made it so easy to pick up breakfast or a late night snack whenever I needed it. 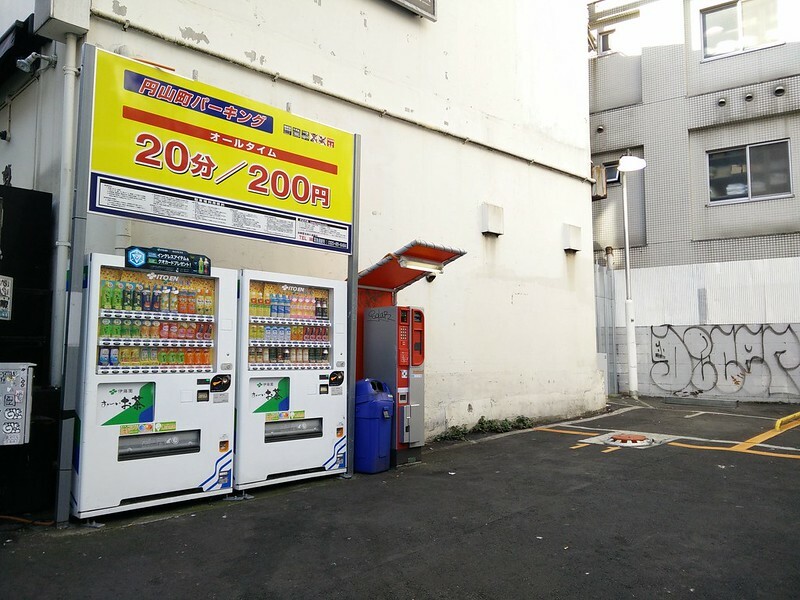 Japan is filled with vending machines. Everywhere you go, you can easily find one and they sell a variety of things. Hot and cold drinks, alcohol, cup noodles, ice cream, and candy. Some even sell you hot food snacks like takoyaki, hot dogs and croquettes. However, the ones I want to focus on are the vending machines at restaurants. In lieu of servers, you order your food from a vending machine. You put your money in, push the button for the item you want and you’re given a ticket. When you’re seated, you hand over the ticket and your food appears. 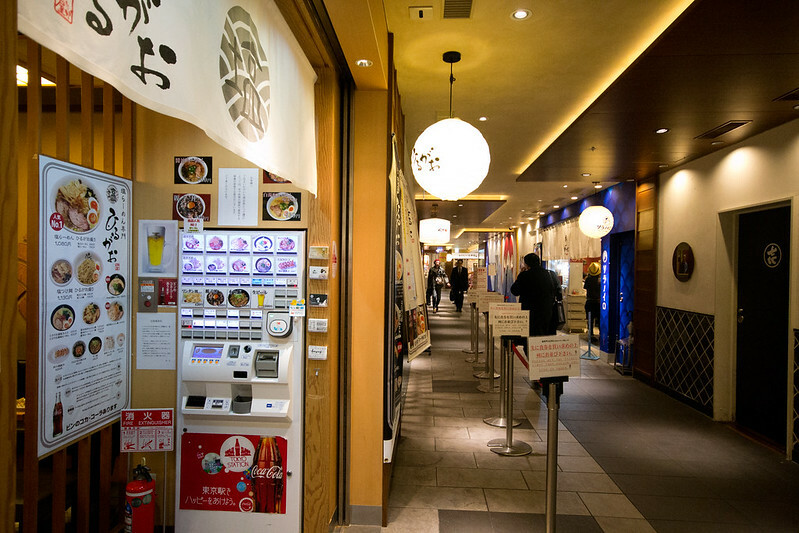 On my second night in Tokyo, we found ourselves ordering from a machine sans photos at a well known tsukemen place (one of the best things I ate in 2015!). It was a confusing process at first because there were none of the promised photos on the machine and everything was in Japanese. In the end, we figured it out, and we got our bowls of noodles. I was so flustered and a line was starting to form after us that I completely forgot to take a photo. Whoops, got caught taking this photo! 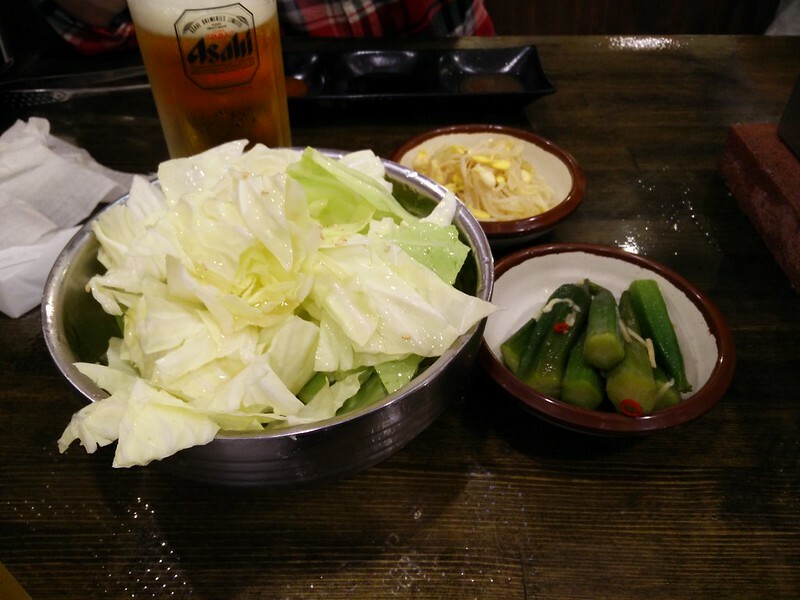 One of my favorite things while eating in Japan, was eating at the bar. When you’re sitting at the bar you get a great view of the kitchen, and you can see what the shop are you doing when they are preparing their food. It is a fascinating dance of skills as the chefs show off their craft. 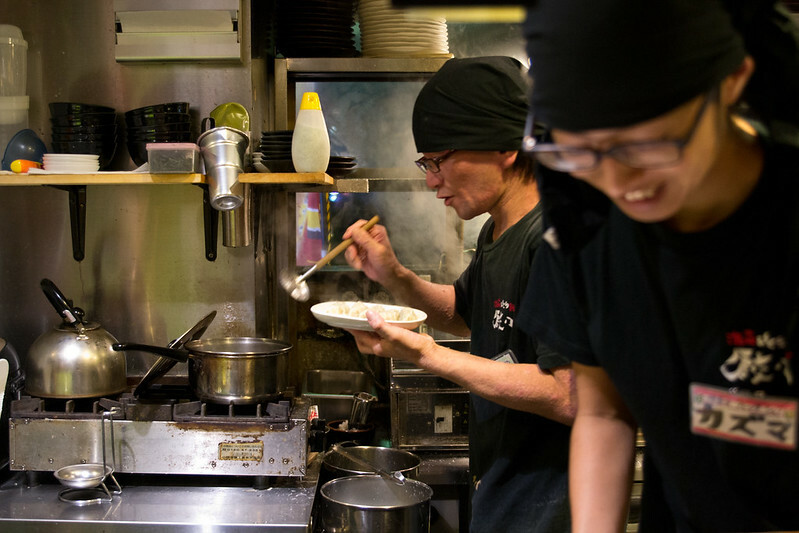 We found that most Japanese restaurants are specialized in one particular dish or style of food and it is fascinating to watch them at work on their specialty. 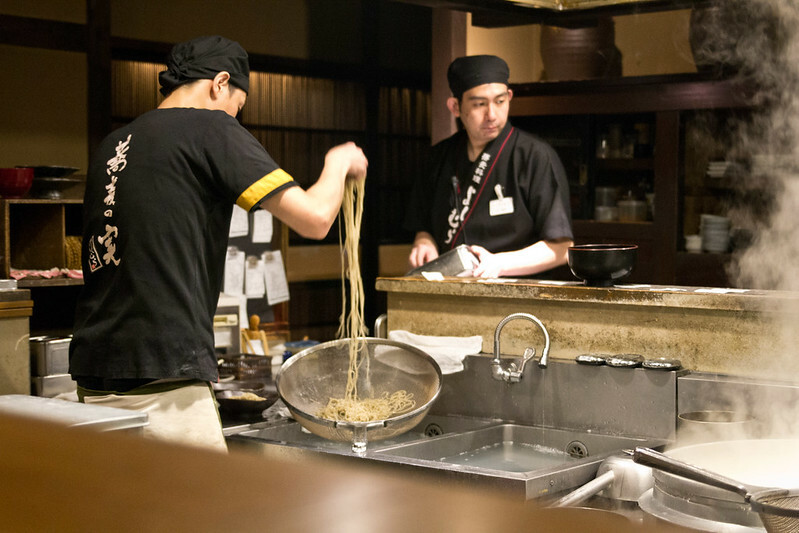 I watched people make soba noodles, cook up plates and plates of gyozas. I saw people put together elaborate bowls of ramen or fry up massive pieces of chicken karaage. It’s definitely a lot of fun to see how a meal comes together and it’s especially good for people watching. Given the option to sit at a table or at the bar, I’d take the bar just for the entertainment purposes. Okonomiyaki is a savoury pancake typically made from flour, grated nagaimo (a type of yam), water or dashi, eggs and shredded cabbage. It is then topped with a variety of fillings depending on your preference. 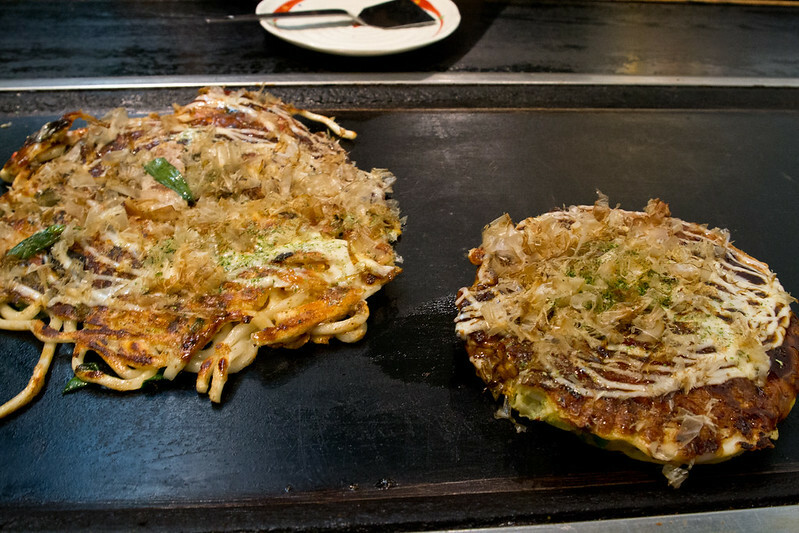 Anything from seafood and chopped meat to mochi and cheese, can be added to the okonomiyaki. 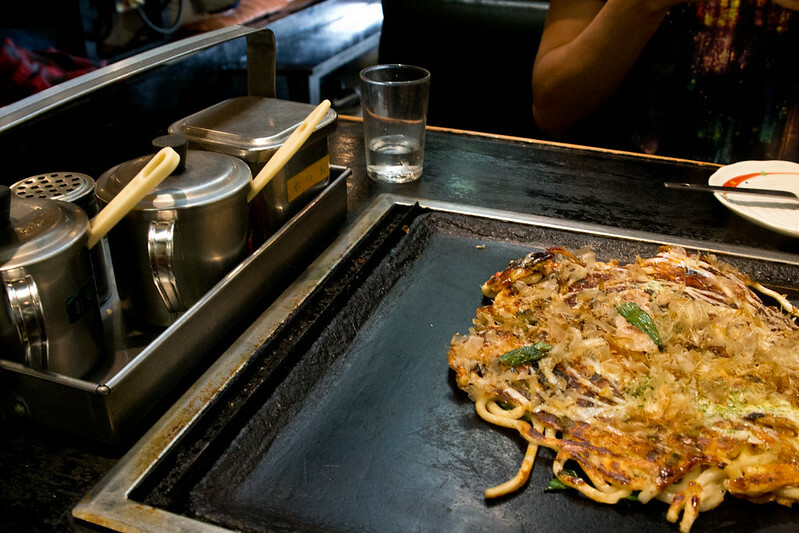 It is said that okonomiyaki originates from Osaka, so this is the best area to try it. Some restaurants will give you a bowl of raw ingredients that you can mix and grill yourself. Others prepare it for you and you can finish it on the hot plate at your table. We tried okonomiyaki in Nara which isn’t too far away from Osaka and found a place that did most of the hard work (aka cooking) for us. The pancake is pan-fried on both sides before being topped with a sauce similar to Worcestershire sauce, seaweed flakes, bonito flakes, Japanese mayonnaise, and pickled ginger. Nothing says good morning like a big bowl of raw fish. And that is exactly what I did when I visited the Tsukiji Fish Market in Tokyo. The Tokyo fish market is one of the largest in the world bringing in tons of fish from around the world. As a result, a number of restaurants and market stalls have sprung up around the market area. it’s the best place to grab some fresh sushi at its source. In the basement of department stores around Japan, you can typically find a massive food hall, or depachikas, full of prepared foods. A food lover’s dream, anything you can think of wanting to eat can be found here. Freshly baked breads, delicious looking sushi rolls, elaborately decorated cakes, tempura, meat on sticks. 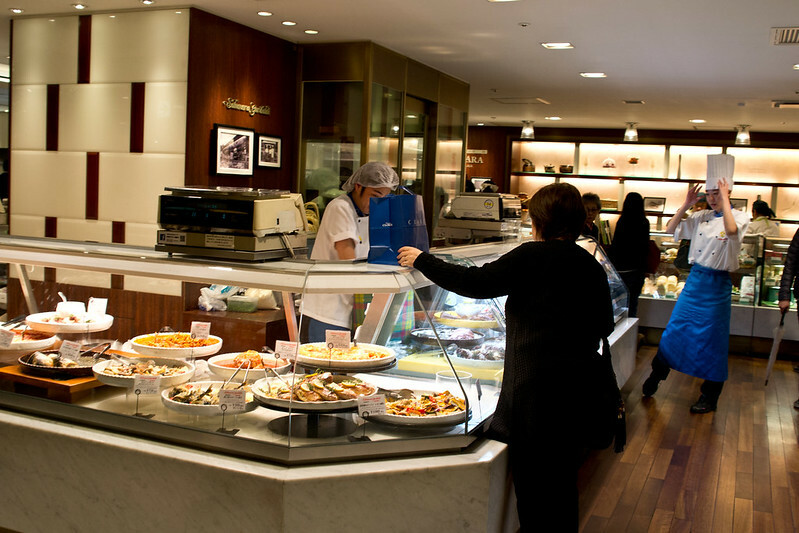 If you have been to the food hall in Harrods in London, it’s a very similar concept. In fact, the number of choices and the amount of people trying to pick up food for lunch or dinner is really overwhelming. For the traveler, it’s a good place to pick up a meal if you don’t feel like cooking or sitting down at a restaurant especially if you find that experience a little intimidating when you first arrive. 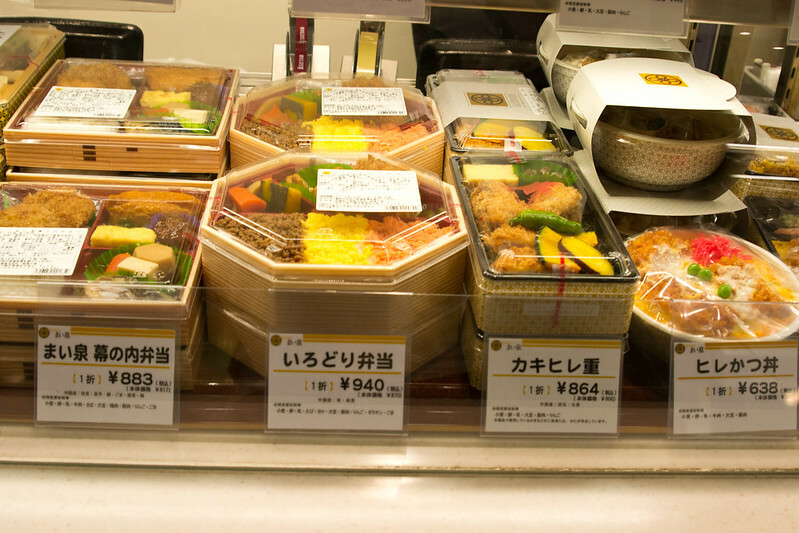 Alternatively there are bento boxes which you can then take with you on a train. In Japan, there so many themed restaurants around the country. From the commonly found maid cafes in the Akihabara area to prison-themed cafes to dining inside the Alice in Wonderland book, there is a themed restaurant for every interest. I had heard amazing things about the Robot Restaurant in Tokyo, but by the time I was investigating going, they were sold out for the nights we were there. 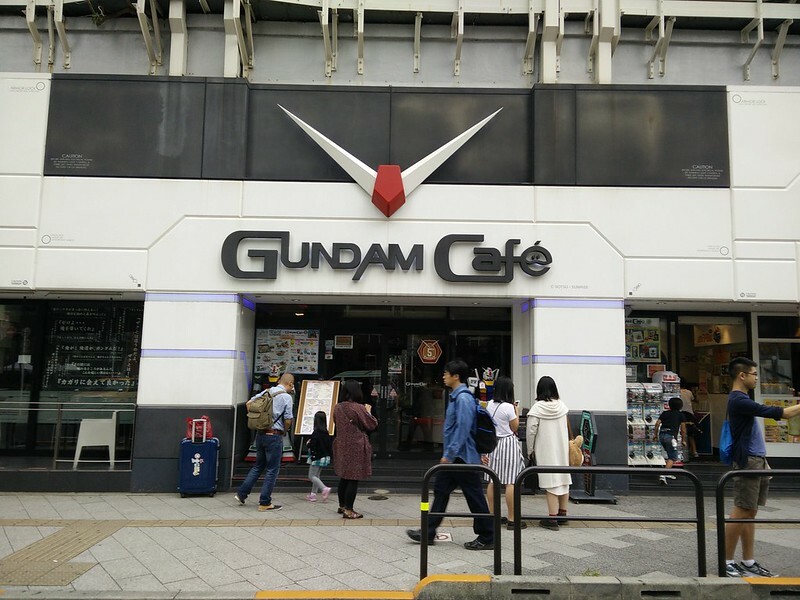 We ended up going to the Gundam Cafe in Akihabara because my friend is a fan of the Gundam Wing anime. Outside a due of Gundams greeted us into the restaurant. The anime was playing on the various TV screens and all the food had a Gundam twist to it. It was probably not the best choice to have as a themed restaurant experience because I felt it wasn’t very immersive, however, it was pretty cool to see how they made the experience to be all about the anime. Because I had just eaten, I only ordered a drink which came with a themed coaster which I kept to give to a friend. 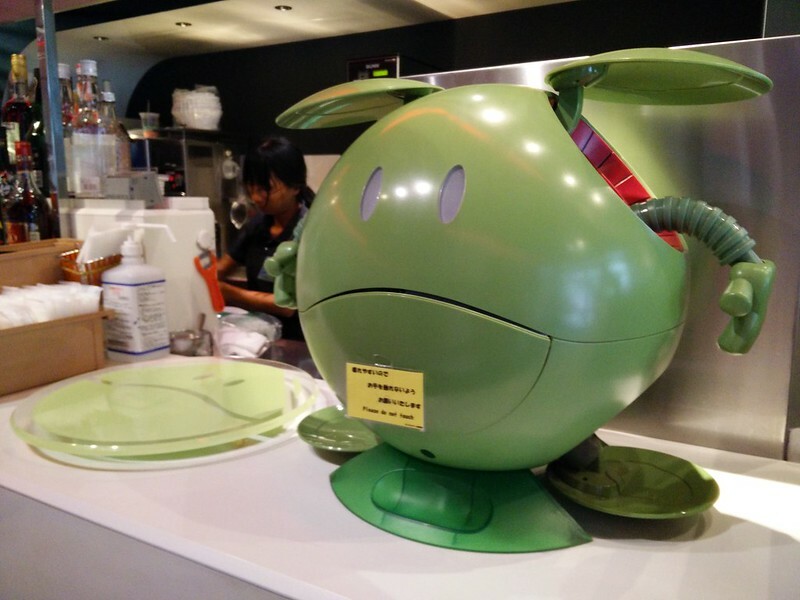 My friend ordered food which came in the shape of Haro, a character from the anime. Don’t expect the food to be amazing. You’re there for more of the experience than anything. Regardless, it’s a pretty cool experience and definitely one that you can’t have elsewhere in the world. 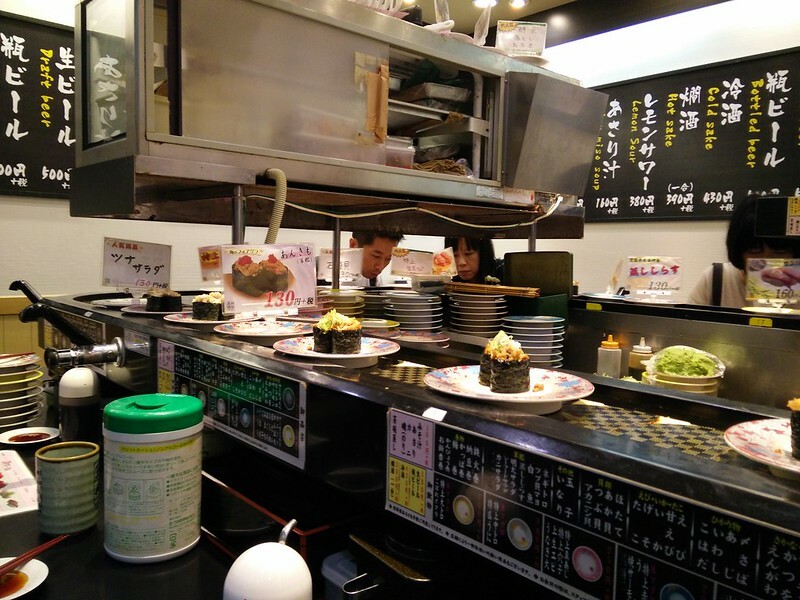 Conveyor belt sushi, or kaiten sushi, is exactly as its name implies. Sushi is prepared and then it travels around on a conveyor belt. You pick the items that you’d like to eat off the belt and at the end, they count up the plates and you get charged. Each plate has a slightly different design or colour which matches up with different prices depending on what is on the plate. This is a great way to see what you can eat before ordering it. It’s also good for those with small appetites (like me!) or those on a budget. 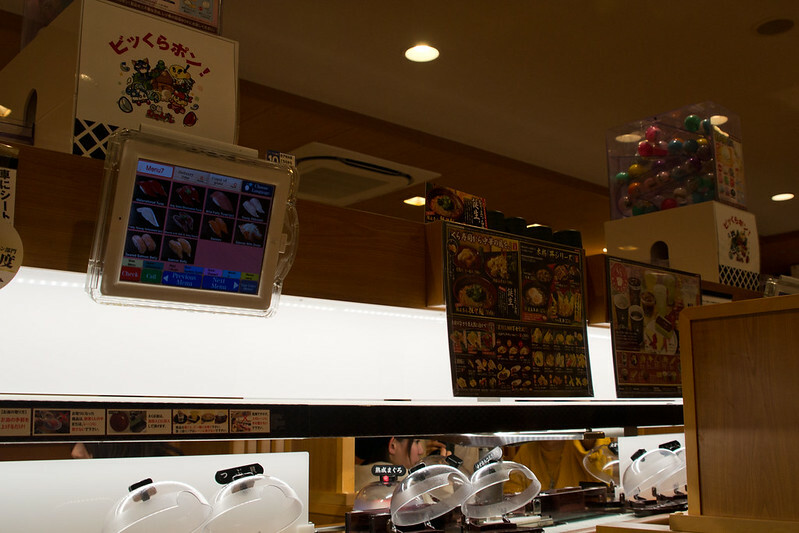 On my return visit to Japan in 2017, I visited another kaiten which had a screen for you to order from. There are lots of sushi places that have a conveyor belt, but we ran out of time so we went to the one in the airport while waiting for our flight. It wasn’t the most amazing sushi I’ve ever had, but watching the plates go around and around was fun. Because we were at a smaller place, you could also order items that you wanted directly from the chefs behind the counter. At other larger places, they often have a screen for you to order from. I found a lot of popular items weren’t available on the belt – they were only putting out specials on the belt – so I ordered the items specifically. It was like having your own personal chef. Once you grab their attention, list the pieces (or point at) you want and they’ll arrive in front of you shortly. Dishes were very reasonably priced and each order comes with at least two pieces. Another interesting aspect is the tea that is served. It comes in powdered form and you mix your hot water found at your seat. There are so many unique dining experiences in Japan. These are just the tip of the iceberg and I already have a large list for the next time I go to Japan. I would love to visit another themed cafe or one of their cat cafes. Perhaps go to an omakase meal where the chef decides on what you eat. 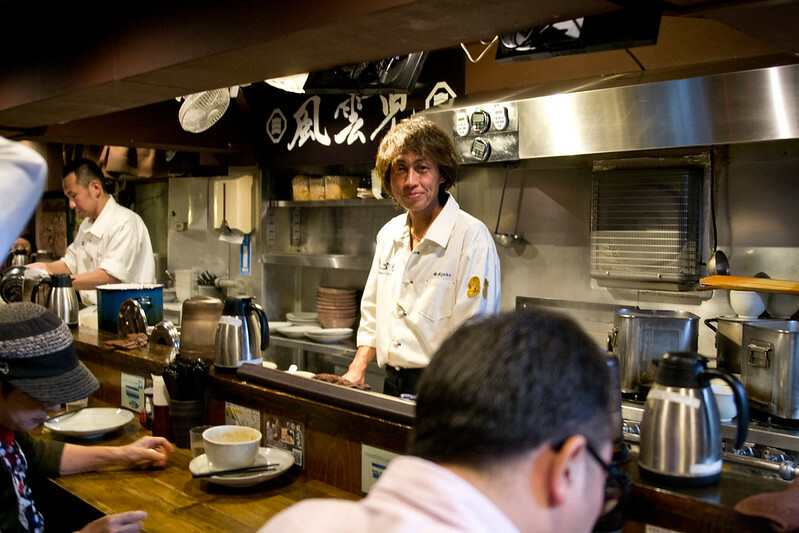 I had also thought about going to a Michelin restaurant in Tokyo seeing as the city has the most in the whole world. Have you been to Japan? What unique eating experiences did you have? I can definitely vouch for these eating experiences in Japan. I lived there for a year and have been back a couple of times. Needless to say, I put on a few pounds after going nuts there each time. Lol. I love the convenience stores and have to say they’re much better than the ones in Korea. 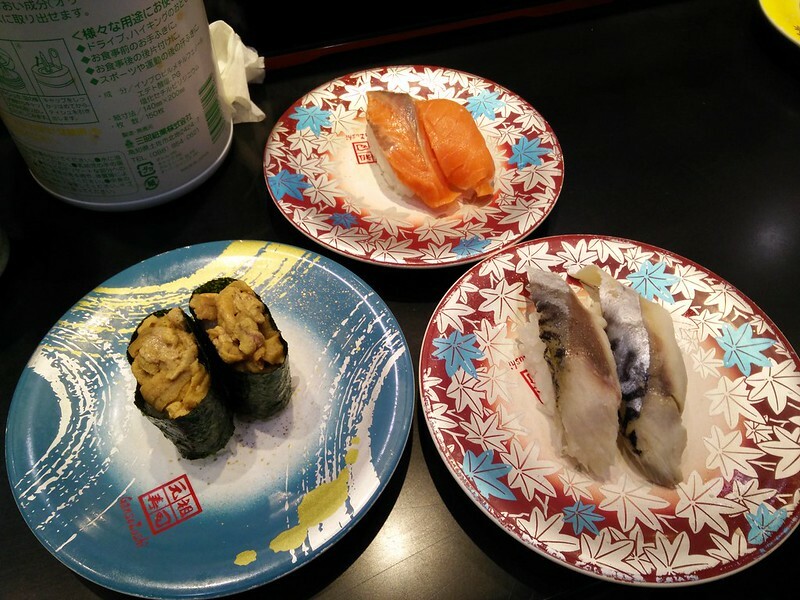 Kaiten Sushi was always a good way to eat cheap until you pile plates higher than yourself, haha. I really wish I could tell you my favorite of them all. Thanks for sharing this. It’s really got me thinking about a future Japan trip like right now! Thanks so much Duke! I can’t wait to go back to Japan and eat it all over again. So much amazing food in the country! certainly a place of weird and different food! But you can’t go past the convenience store fried chicken! Thanks for bringing back some great memories from our trip to Japan last year. We did not do all of the options you have listed, but we did most of them and had a lovely time! I was pleased to see that by the end of the trip our two oldest children had become ‘chopstick competent’! Okonomiyaki is my favorite Japanese streetfood! Oh this post made me hungry!!! Too bad I’m not in Japan. I enjoyed reading this post, it sounds so interesting, and nice that you got to go to places that didn’t have an english menu, makes it seem more local and less touristy (I’m hopeing that was the case)! Thanks! It was definitely daunting to order in places without English menus, but we just pointed at photos or at the plastic food displays they had. So useful! This is an awesome post! 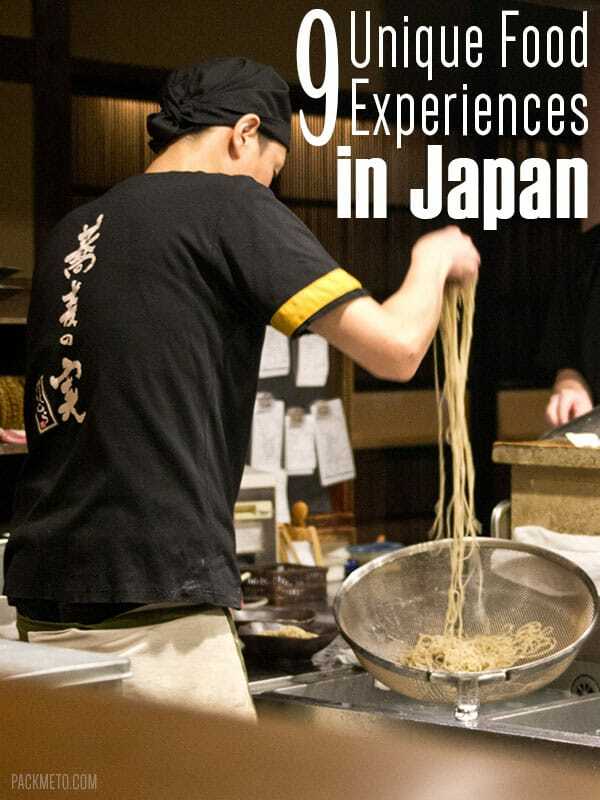 Clearly I need to go back to Japan and try some of these experiences. Especially Japanese bbq! I think all we managed to check off is eating at the counter and convenience store. Oh wait, we did have a smoothie at a themed cafe (just waitresses dressed up in some kind of costumes) but it was really awkward because there was absolutely NOBODY else in there. Thanks Anna! Oh yes, it sounds like you do need to try out these things next time you’re in Japan. I wouldn’t mind going to another themed cafe as well. The experience is just kinda odd even when there are other people there! Japan is definitely one of the places in the world that I’m dying to go to just to eat the food! I love this post because I love Japanese food!!! 😀 AND it’s great to find another new blog on Travel Tuesday! Connected on Twitter, Instagram, and Google+ now! Thanks for linking up with us! I loved the department store food in Japan. It was such a surprise to me! My favourite were these savoury buns stuffed with curry sauce. YUM! The department store food halls are so cool. I just can’t get over the variety! I can’t wait to get to Japan, especially since sushi is one of my favorite foods. This list is fantastic, and definitely broadens my knowledge of what food is good in Japan, other than sushi! Thanks! There is so much great food in Japan. I feel like I missed out on a bunch still. Kamakura they press squid into a cracker that is a audio/ visual treat as well as being tasty. This is probably one of the best travel articles I’ve read on Japan. That country’s so weir and quirky while being such a food haven. Thanks for sharing this! Thank you so much Larisse!